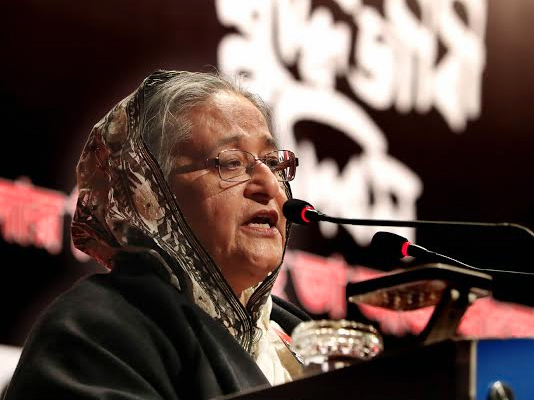 Prime Minister Sheikh Hasina on Friday came down heavily on BNP and its election partners for giving nominations to the persons convicted for corruption, militancy and war crimes saying it seemed that they would like to take the country’s politics to the ‘crime world’. “Where they want to take the country by making those persons parliament members,” she said while addressing a discussion in city today marking the Martyred Intellectuals’ Day. “If they are elected as parliamentarians what will be the situation of Bangladesh and how people will get security of their lives and property…, and how the country would prosper?” she asked. Bangladesh Awami League organised the discussion at Krishibid Institution auditorium with Prime Minister and president of the party Sheikh Hasina in the chair. The prime Minister said the US Congress has also sent a list of the persons linked with terrorism and militancy which included some names of those persons. Canada Federal court also branded BNP as a militant organisation rejecting petition of one their leaders seeking political asylum in that country, she added. Sheikh Hasina questioned about the conscience of the persons who have been vocal against the government criticising its activities. Now they (persons) have forged electoral unity with BNP and anti-liberation forces, she added.